I returned in 2017 to continue research and swim at Playa Jibacoa. 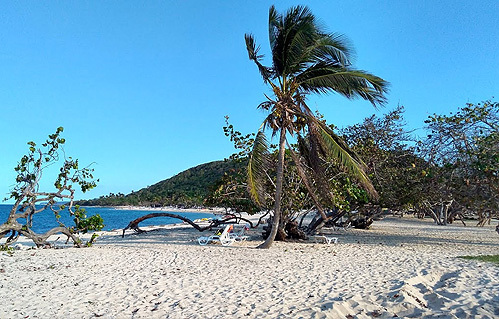 This hidden resort area is roughly halfway between Varadero and Havana and a destination for divers and snorkelers. If you are a strong swimmer, a section of coral reef is within reach of shore. The staff here are mostly friendly. It took a couple of days but I got to know the other guests and learned there are many regulars. You will often hear people say they have been coming here for years. The “lobby” of the resort is in its own separate building where you find the front desk and a bar off to the side. Sitting at one of the tables, my attention was drawn to a mural on the wall. It might have been an artistic representation of a reef but it looked more like the cover of a H.P. Lovecraft story collection, complete with long tentacles and underwater scenes that somehow don’t make sense. The mysterious oceans present a wellspring for the human imagination. From Lord Tennyson to H.P Lovecraft, writers have created intruiging stories of things hidden in the deep. Lovecraft wrote weird tales of advanced beings that sleep and dream in the “slime” at the bottom of sea. Quite often, some poor New Englander will go insane after discovering these creatures. I think it was Lovecraft’s sense of humor saying the people of his day were living inside a box and one day a monster would rise out of the sea to literally trash their world. The secret priests would take great Cthulhu from His tomb to revive His subjects and resume His rule of earth. The time would be easy to know, for then mankind would have become as the Great Old Ones; free and wild and beyond good and evil, with laws and morals thrown aside and all men shouting and killing and reveling in joy”. 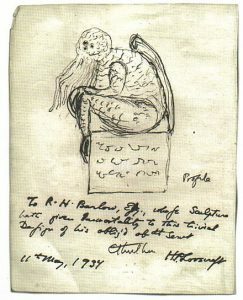 Cthulhu is Lovecraft’s most prominent creature and his tentacle-face image has been borrowed by the Pirates of the Caribbean movie franchise. A popular movie about Lovecraft’s behemoth has yet to be made but if done well enough, it might strike terror in the same way as Orson Wells famous “War of the Worlds” broadcast. For Cthulhu is no pirate but an ingenious and invincible monster! Lab rats and animal experiments aside, a sufficiently advanced and psychically developed creature might be able to influence the dreams of the underdeveloped and spiritually-lacking. To think that we might be the “rats” in Cthulhus’s maze is a disturbing thought to say the least! Scarily enough, it seems that dreams can be influenced telepathically! At the Maimonides Medical Center, parapsychologist Stanley Krippner and associates found evidence that people were able to telepathically influence the dreams of others (see https://www.youtube.com/watch?v=Bluy9qvN0Qg&t=99s at 25:07). Critics later said the experiments were not replicated (see https://en.wikipedia.org/wiki/Dream_telepathy#Experiments) but others argue the replication results say otherwise. “When we look at all the attempted (dream telepathy) replications we still get an above chance ratio”. Like other questors, I want to see the Cuban Underwater City (see part 1 of this series). So I thought I might try something akin to remote viewing while visiting the resort. “Using the standards applied to any other area of science, it is concluded that psychic functioning has been well established. The statistical results of the studies examined are far beyond what is expected by chance. Arguments that these results could be due to methodological flaws in the experiments are soundly refuted. Effects of similar magnitude to those found in government sponsored research at SRI and SAIC have been replicated at a number of laboratories across the world. Such consistency cannot be readily explained by claims of flaws or fraud”. In Lovecraft’s classic short novel The Dream-Quest of Unknown Kadath, the story protagonist Randolph Carter attempts to see a majestic and forbidden city through his night-time dreams. Likewise, I wondered if I could use nighttime dreams to view the “Underwater City” of the non-fiction world. Some believe that dreams are only constructions of the brain and the lucid dreamer does not actually travel. But a review of the literature on psychic dreams allows me to consider otherwise (see http://www.worlddreambank.org/G/GEODE.HTM and the work of Louisa Rhine). We seem to have the ability to perceive things distant in space and time and apparently, this ability extends during sleep. I am also encouraged by the writings of the researcher and writer, Colin Wilson. Wilson had much success with lucid dreaming when he reminded himself during the day of his goals. I thought if I could remind myself during waking hours, I might just glimpse the underwater city during slumber. At regular intervals during the day, I reminded myself to seek the city while I slept. Since it is easy to forget dreams during the day, I left a journal by my bed to record what was experienced. I dreamt of things back home the first night but remained hopeful. I normally dream well and can remember the content for a short time upon waking. Rarely does a night go by where there are no dreams to recall but for mornings 2 thru 7 of my vacation, I couldn’t remember a thing! Oddly enough, all dreams were blacked out! I attempted to see if there were other intervening variables. I was away from home but that never interfered with dream recall. Alcohol was not a factor as on this particular trip, I drank little. After viewing the above Stanley Krippner interview, I am looking for data on electrical storms over Cuba and sunspot activity for the month of November, 2017 in case that created “noise” or influenced psychic ability. I don’t know if something prevented me from seeing the underwater city but being unable to remember a single dream was peculiar. It doesn’t serve as “proof” but I began to wonder if there might be some kind of psychic barrier surrounding the Cuban Underwater City. Similarly, the character Randolph Carter had a difficult time trying to “see” the forbidden city in Lovecraft’s tales – perhaps there are places “off-limits” to human extrasensory perception and blocked by psychic guardians. The Cuban Underwater city is too deep for divers and close inspection but something a little more tangible exists in the waters off the the Ryukyu Islands in Japan. The Yonaguni Monument is at the center of a lively debate. 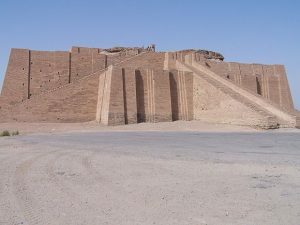 There are gigantic staircases and terrace or plaza-like platforms built in a style that reminds me of an ancient acropolis such as the ad hoc ancient Mayan structures at Tonina or Peidra Negras. Interestingly, Sumerians and others had an amphibious teacher (the Enki-Dagon-Oannes) and the Mesoamericans (including Mayans and Aztecs) had the “feathered serpent” Quetzalcoatl who was also a bringer of civilization. Could there be a connection between these acropolis structures and the abodes of non-human teacher “gods”? He has said the geometry of the dream-place he saw was abnormal, non-Euclidean, and loathsomely redolent of spheres and dimensions apart from ours. Now an unlettered seaman felt the same thing whilst gazing at the terrible reality… Johansen and his men landed at a sloping mud-bank on this monstrous Acropolis, and clambered sloppily up over titan oozy blocks which could have been no mortal staircase”. Euclidean right angles and symmetry might be functional and pleasing to humans but what if the monument was built by something that dwells in more than 3 spatial dimensions? The antiquity of the spot was unwholesome and I longed to encounter some sign or device to prove that the city was indeed fashioned by mankind. There were certain proportions and dimensions in the ruins which I did not like”. I wonder if Yonaguni might be related to the underwater palace of Japanese folklore. This place is mentioned in “Urashima Tarō”; a tale of a fisherman who rides a turtle to the “dragon palace” that lies deep beneath the sea. This is the home of the Japanese dragon who is able to transform into human shape. In the story, Taro is entertained by the dragon’s daughter, Otohime for what seems a few days. Upon returning to his village, Taro learns that 300 hundred years have passed in his own time! It would seem Taro had crossed time as well as spatial dimensions to stay at the palace of a sea serpent (more on this in an upcoming post on Scotland, the Loch Ness Monster and Time Travel; coming this Summer!). Some might claim the Petra Snake Monument in Jordan looks like Cthulhu with the body of a snake but it is a bit of stretch to consider this proof of an “Elder God” reality. To be fair, there isn’t much evidence at this time to point to a Lovecraftian version of history. Strange formations like Yonaguni do exist but we do not know for sure if they were once cities occupied by non-human monsters. It might be Denisovan or just natural as professor Schoch believes. Lovecraft’s tales are only fiction yet his ideas might give an alternative hypothesis to some of the out-of-place and out-of-time underwater finds. Atlantis and Mu might not account for every ancient city-like anomaly. 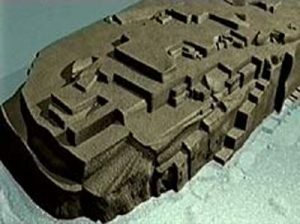 If it is a ruin and not a natural formation, the Cuban underwater city might be a prehistorical construction by a non-human intelligence! Lovecraft’s stories might just be fiction but the search for non-human intelligence on Earth could be a worthwhile pursuit with practical applications for the future. For example, if human beings will someday explore deep space, we should have an idea how to identify and approach other intelligences! Getting back to the Jibacoa resort, I was ready to see the nearby reef and went out on a calm and beautiful day. After swimming at length, I reached the shoal and began exploring. My mask fogged up on occasion but I was able to encircle an entire reef. I saw the marvelous fish, coral and aquatic plants living there. Far beneath, I saw a pair of divers exploring the base and sea bed. I can now appreciate the importance of the buddy system as my leg locked into a painful cramp. For the next twenty minutes I could only tread water as an extreme pain held me in its grip! Luckily, I was able to relax and massage the muscle enough to swim back to shore. Tip: At Cuban resorts the solo traveler can easily make new friends. If you can befriend another tourist you feel is mature, competent and level-headed, ask them to swim along with you. Avoid “fishy” people. It is believed the Octopus evolved intelligence millions of years before humanity. These creatures employ tools, solve problems and use visual cues to mimic their environment. Octopus videos on YouTube, show them solving problems that would perplex many people! Animal intelligence is a controversial topic but in the Octopus and other Cephalopods (including squids and cuttlefish) the “impressive spatial learning capacity, navigational abilities, and predatory techniques” are widely acknowledged by the research community (see https://en.wikipedia.org/wiki/Cephalopod_intelligence). In some aquariums, octopuses have learned to turn down the lights by shooting jets of water and shorting the circuit (see https://www.scientificamerican.com/article/the-mind-of-an-octopus/). Like other intelligent animals, the octopus does not like to be imprisoned or bored. According to researcher Jennifer Mather, the octopus will engage in play behavior. That is, “the deliberate, repeated, outwardly useless activity through which smarter animals explore their world and refine their skills” (see http://discovermagazine.com/2003/oct/feateye). It turns out that octopuses are not the solitary creatures scientists once thought but can live together in “cities” (see http://www.businessinsider.com/octopus-city-octlantis-discovered-2017-9). The Octopus also builds shelters on the sea floor (see https://www.cbsnews.com/news/octopuses-build-coconut-shell-shelters/) and “decorates” these homes! Rock star and former Beatle Ringo Starr wrote the famous song about the Octopus’s Garden after hanging out with a ship’s captain. One night over dinner, the captain told Starr how the octopus is observed to pick up stones and shiny objects which they use to build “gardens”. Sick and and tired of tensions within the Beatles camp, Starr liked the idea of escaping under the sea and hiding out in an Octopus’s Garden where there would be no one to tell him “what to do” (listen to “Abbey Road”. The Beatles Interview Database. Retrieved 25 September 2009. The song itself is on the Abbey Road record). So not only are they smart, they likely dream! Cthulhu might not be the only tentacled creature haunting the dreamworld! Journalist Max Knoblauch jokes the octopus is the species most likely to “overthrow humans”! (see https://psmag.com/environment/planet-octopuses-animal-species-likely-rise-overthrow-humans-67576). Who knows? They might pop up to steal our condos, shiny trinkets and shruberry one day! Fortunately for us, the average octopus has a lifespan of only 3-5 years, making strategy and the long-term knowledge accumulation required for advanced warfare improbable. But what if there is a longer-living, super-intelligent and more aggressive Cephalopod waiting for the right time to return and conquer? It wasn’t until the 21st century scientists were able to confirm the existence of the Giant Squid. Marine Biologist Danna Staaf points out that Cephalopods ruled the oceans long before humans, mammals and even dinosaurs entered the picture (see her 2017 book “Squid Empire: The Rise and Fall of the Cephalopods”). An advanced dreaming creature might decide it’s time to rise and take the world. Human beings have been effecting the environment at an alarming rate and UFOs have a history of showing up around our Nuclear facilities and tests (see “Owned by Aliens? US missile guards claim UFOs target global nukes” on YouTube and the voluminous work of ufologist Robert Hastings). Are some UFOs and USOs the materialized avatars of a dreaming non-human intelligence? If built long before homo sapien civilization, could this be the former dwelling place of a non-human intelligence? Cuba has no shortage of mystery and I look forward to exploring more of the island, her secrets and surrounding waters.